Sound Studio is great for recording audio on your Mac, either using the line-in jack or internal mic as the signal source. We have found it particularly good for recording podcasts and conducting interviews over Skype, thanks to an intuitively designed time-marking system and clear input level panel. The one glaring annoyance with previous versions of Studio was that the peaks and troughs of the recorded wave track didn't appear onscreen until the end of the recording session. You were never quite sure that the recording was going successfully. In version 3.5, Freeverse has finally woken up and addressed this. Now the wave appears in real time as you go along. The rest of the interface has been left alone, apart from some basic redesigning of the buttons. New features have been added into the background, though. Chief among them is the ability to add ID3/iTunes tags to the tracks as soon as they are recorded. 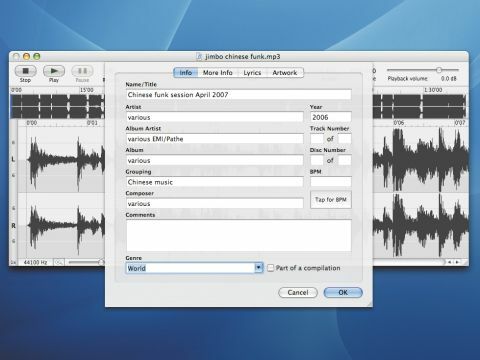 These metadata tags let you name and label tracks in detail from within Sound Studio, instead of waiting until you've imported the files into iTunes. Press C [I] and an iTunes-style metadata panel appears. This is a timesaving feature, but we did experience bugs. Tracks that we added metadata to before importing to iTunes showed up in iTunes as podcasts. We chalked this up to teething trouble, and a member on the Freeverse forum (http://forum.freeserve. com) found a workaround. Also, you need to download a free plug-in called the LAME MP3 framework to export tracks from Sound Studio as MP3 files. A signpost to this download link is in the DMG package, but it really should have been pre-installed. Despite the bumps, Sound Studio is a good performer. Handlily, version 3.5 is free to owners of 3.0.